» Is Medication Titration in Heart Failure too Complex? Is Medication Titration in Heart Failure too Complex? Large-scale randomised controlled trials (RCTs) have demonstrated that angiotensin-converting enzyme inhibitors, angiotensin receptor blockers and beta-blockers decrease mortality and hospitalisation in patients with heart failure (HF) associated with a reduced left ventricular ejection fraction. This has led to high prescription rates; however, these drugs are generally prescribed at much lower doses than the doses achieved in the RCTs. 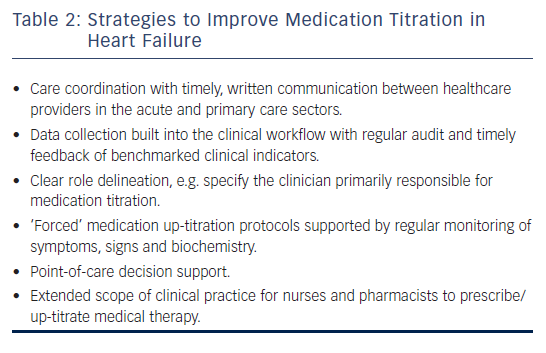 A number of strategies have been evaluated to improve medication titration in HF, including forced medication up-titration protocols, point-of-care decision support and extended scope of clinical practice for nurses and pharmacists. Most successful strategies have been multifaceted and have adapted existing multidisciplinary models of care. Furthermore, given the central role of general practitioners in long-term monitoring and care coordination in HF patients, these strategies should engage with primary care to facilitate the transition between the acute and primary healthcare sectors. JJA has received honoraria, consultancy fees and/or sponsorship to attend conferences from Alphapharm, AstraZeneca, CSL, Menarini, Novartis and Servier. AH has no conflict of interest to declare. The prevalence of heart failure (HF) continues to rise, driven by an ageing population, increasing rates of obesity and diabetes, and better survival in patients with cardiovascular disease.1 While HF is associated with substantial morbidity and mortality, a number of treatments have been shown to improve outcomes in large-scale randomised controlled trials (RCT), including pharmacological inhibition of the renin–angiotensin system (with or without neprilysin inhibition), betablockers, mineralocorticoid receptor antagonists, sinus node inhibition, cardiac resynchronisation therapy with biventricular pacing, implantable cardioverter defibrillators and multidisciplinary models of care.2–4 In order to realise the benefits of these treatments, however, we need to consider how patients were selected for these RCT and how the treatments were delivered. The adoption of innovative models of care and the delivery of device therapies can be particularly challenging, given that they are highly dependent on the individual operators and rely on substantial infrastructure and staffing support. At first glance, it would appear that the administration of pharmacological therapies for HF should be relatively straightforward, but such therapies are also highly dependent on the individual prescribers, rely on substantial infrastructure and staffing support, and involve real complexities around medication persistence and patient adherence. In this review, we will discuss medication titration in HF and consider whether or not it is too complex in the real-world setting. We conducted a literature search in November and December 2016 using PubMed. Keywords included ‘heart failure’, which was used in combination with ‘medication’ or ‘therapy’ and ‘titration’ or ‘up-titration’, ‘dose’ or ‘target dose’. We also searched reference lists of relevant primary studies and systematic reviews. We used no language or date restrictions. All types of study design were included where medication titration was a primary endpoint. In the absence of an easily measurable and accepted HF physiological surrogate endpoint, the large HF RCTs evaluating the efficacy of ACEIs, ARBs and beta-blockers used forced up-titration at pre-specified intervals, unless there were adverse events or intolerance, aiming for target doses largely guided by those used to treat hypertension. Early studies reported conflicting results as to whether ACEIs have a dose–response effect on haemodynamic measures in HF patients.15,16 The NETWORK investigators compared three doses of enalapril in 1,532 HF patients and failed to demonstrate a dose-related difference in the combined endpoint of death, HF-related hospitalisation or worsening HF.17 A reduced left ventricular ejection fraction was not a prerequisite for patient selection, however, and patients were only followed for 24 weeks. The Assessment of Treatment with Lisinopril and Survival (ATLAS) study is the largest to address the question of whether we should aim for higher doses of ACEIs. In this study, 3,164 HFrEF patients were randomised to receive either low-dose (2.5–5.0 mg/day) or very-high-dose (32.5–35.0 mg/day) lisinopril.18 While there was no significant difference in the primary endpoint of all-cause mortality, there was a significant 12 % relative risk reduction in the combined endpoint of all-cause mortality or hospitalisation, which was driven by a 24 % relative risk reduction in HF hospitalisation. This study was originally powered based on the assumption that low-dose lisinopril would have no effect on mortality. Indirect comparisons, however, suggest that the low dose achieved approximately half the reduction in mortality and HF hospitalisation observed with the doses of enalapril used in the Studies of Left Ventricular Dysfunction (SOLVD)–Treatment research.10 The authors concluded that patients should be titrated beyond low doses of ACEIs unless the dose is limited by side effects.18 While it was unclear whether patients should be titrated to the very high dose of ACEI used in the ATLAS study, the difference between intermediate and high doses seemed to be small. Indirect comparison of the initial Cardiac Insufficiency Bisoprolol Study (CIBIS) and CIBIS-II provides some support for the use of higher doses of beta-blockers.5,19 CIBIS (up to 5 mg/day bisoprolol without forced up-titration) failed to achieve its primary endpoint, with a non-significant 20 % relative risk reduction in mortality; however, CIBIS-II (forced up-titration to 10 mg/day bisoprolol) demonstrated an impressive 34 % relative risk reduction in mortality in HFrEF patients. Subsequent post-hoc analyses from the Metoprolol CR/XL Randomised Intervention Trial in Congestive Heart failure (MERIT-HF) study and CIBISII reported similar placebo-corrected benefits regardless of the dose of beta-blocker achieved.20,21 These were non-randomised comparisons, however, and are therefore subject to selection bias. Furthermore, based upon the trial design, all patients had been exposed to forced up-titration to the pre-specified target dose and were therefore on maximal tolerated doses. The Multicenter Oral Carvedilol Heart Failure Assessment (MOCHA) study reported dose-related, placebo-corrected improvements in left ventricular ejection fraction and survival in patients who were randomised to receive 25 mg twice daily carvedilol compared with lower doses; however, this analysis was based upon 25 deaths.22 While this was a small study, it nonetheless provided further support for maximal tolerated doses of beta-blockers. Clinicians have generally paid greater attention to the up-titration of beta-blockers, given the impressive benefits achieved in clinical trials that involved the forced up-titration of these drugs to target doses on top of background therapy (which included an ACEI or ARB in >90 % of patients).5,6,11,14 Furthermore, while ACEIs can be safely up-titrated in a relatively short time period,27 a ‘start low and go slow’ approach is generally taken with beta-blockers, given their short-term, negative inotropic effects. 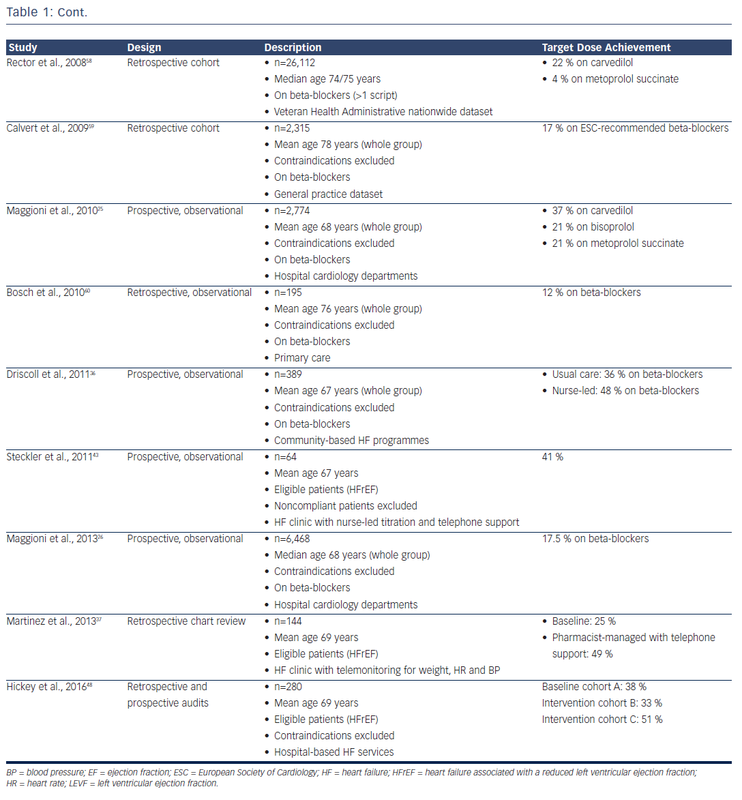 Despite the benefits, however, only 10–30 % of patients achieve target doses of beta-blockers in most real-world studies (see Table 1). One reason for the low titration rates achieved in clinical practice may be that the patients are not selected in the same way as those enrolled in clinical trials; in practice, patients are generally over a decade older with numerous comorbidities. Indeed, after applying all the RCT inclusion and exclusion criteria to the Euro Heart Survey on Heart Failure population,28 only 9 % of patients would have been eligible for enrolment in the SOLVD–Treatment study and 5 % in the MERIT-HF study.29 Even in the patients who satisfied all the eligibility criteria for those studies, only 46 % achieved target doses of ACEIs and just 6 % achieved target doses of beta-blockers.29 This outcome suggests that the systems available to support clinical trials (including the availability of dedicated research nurses applying forced medication up-titration under the supervision of a principal investigator) may not be readily available in routine clinical practice. A number of strategies have been evaluated to improve medication prescribing in HF, including case management, educational initiatives, decision support, telephone-based monitoring, clinical audit and feedback, strategies to improve communication between healthcare providers and extended scope of clinical practice.30,34–44 While education, decision support and clinical audit and feedback have been successfully applied to improve prescribing behaviour, these approaches alone appear to be insufficient to improve medication titration.39,40 Successful strategies have generally involved multifaceted interventions and are likely to be context-specific (see Table 2). A major limitation of strategies that are either coupled with established HF disease management programmes or that require additional staffing is their sustainability and limited external validity, since access to multidisciplinary HF services varies across jurisdictions.49 Given the central role played by the GP, processes that engage primary care are more likely to be successful in the broader HF population. Some studies, however, have reported a reluctance on the part of GPs to up-titrate HF therapy.50 Despite this, we observed increasing primary care involvement in our quality improvement study, with the patient’s GP being the designated healthcare provider responsible for medication titration in half the patients in the final cohort, when the highest titration rates were achieved.48 This suggests that, in addition to long-term monitoring and care coordination,51,52 GPs could play a more active role in medication titration. There have been marked improvements in ACEI and beta-blocker prescription rates for HFrEF over the past two decades; however, the doses prescribed in clinical practice are generally much lower than those achieved in the RCTs. While the clinical trials were generally not designed to determine whether the benefits were dose related, the successful studies were nonetheless based on forced up-titration to pre-specified target doses. Clinical audit and feedback have been shown to improve prescribing behaviour; however, additional contextspecific measures are required to support medication titration. The scope of clinical practice for nurses and pharmacists has successfully been extended to medication titration and builds on the recognised benefits of multidisciplinary HF disease management. However, strategies that engage primary care with timely communication, clear role delineation and point-of-care decision support may have wider applicability to allow the impressive gains demonstrated in the clinical trials to be applied to the broader HF population. Bui AL, Horwich TB, Fonarow GC. Epidemiology and risk profile of heart failure. Nat Rev Cardiol 2011;8:30–41. Ponikowski P, Voors AA, Anker SD, et al; Authors/Task Force Members. 2016 ESC Guidelines for the diagnosis and treatment of acute and chronic heart failure: The Task Force for the diagnosis and treatment of acute and chronic heart failure of the European Society of Cardiology (ESC). Developed with the special contribution of the Heart Failure Association (HFA) of the ESC. Eur Heart J 2016;37:2129–200. Yancy CW, Jessup M, Bozkurt B, et al; American College of Cardiology Foundation; American Heart Association Task Force of Practice Guidelines. 2013 ACCF/AHA guideline for the management of heart failure: a report of the American College of Cardiology Foundation/American Heart Association Task Force on Practice Guidelines. J Am Coll Cardiol 2013;62:e147–239. Krum H, Jelinek MV, Stewart S, et al. 2011 update to National Heart Foundation of Australia and Cardiac Society of Australia and New Zealand guidelines for the prevention, detection and management of chronic heart failure in Australia, 2006. Med J Aust 2011;194:405–9. CIBIS-II Investigators and Committees. The Cardiac Insufficiency Bisoprolol Study II (CIBIS-II): a randomised trial. Lancet 1999;353:9–13. MERIT-HF Study Group. Effect of metoprolol CR/XL in chronic heart failure: Metoprolol CR/XL Randomised Intervention Trial in Congestive Heart Failure (MERIT-HF). Lancet 1999;353: 2001–7. Pitt B, Zannad F, Remme WJ, et al. The effect of spironolactone on morbidity and mortality in patients with severe heart failure. N Engl J Med 1999;341:709–17. Swedberg K, Kjekshus J. Effects of enalapril on mortality in severe congestive heart failure: results of the Cooperative North Scandinavian Enalapril Survival Study (CONSENSUS). Am J Cardiol 1988;62:60A–66A. Zannad F, McMurray JJ, Krum H, et al; EMPHASIS-HF Study Group. Eplerenone in patients with systolic heart failure and mild symptoms. N Engl J Med 2011;364:11–21. SOLVD Investigators. Effect of enalapril on survival in patients with reduced left ventricular ejection fractions and congestive heart failure. The SOLVD Investigators. N Engl J Med 1991;325:293–302. Packer M, Coats AJ, Fowler MB, et al; Carvediol Prospective Randomized Cumulative Survival Study Group. Effect of carvedilol on survival in severe chronic heart failure. N Engl J Med 2001;344:1651–8. Granger CB, McMurray JJ, Yusuf S, et al; CHARM Investigators and Committees. Effects of candesartan in patients with chronic heart failure and reduced left-ventricular systolic function intolerant to angiotensin-converting-enzyme inhibitors: the CHARM-Alternative trial. Lancet 2003;362:772–6. Hayman S, Atherton JJ. Should angiotensin receptor neprilysin inhibitors replace angiotensin-converting enzyme inhibitors in heart failure with a reduced ejection fraction? Cardiac Failure Review 2016;2:47–50. Kotecha D, Holmes J, Krum H, et al; Beta-Blockers in Heart Failure Collaborative Group. Efficacy of β blockers in patients with heart failure plus atrial fibrillation: an individual-patient data meta-analysis. Lancet 2014;384:2235–43. Uretsky BF, Shaver JA, Liang CS, et al. Modulation of hemodynamic effects with a converting enzyme inhibitor: acute hemodynamic dose-response relationship of a new angiotensin converting enzyme inhibitor, lisinopril, with observations on long-term clinical, functional, and biochemical responses. Am Heart J 1988;116:480–8. Pacher R, Stanek B, Globits S, et al. Effects of two different enalapril dosages on clinical, haemodynamic and neurohumoral response of patients with severe congestive heart failure. Eur Heart J 1996;17:1223–32. The NETWORK Investigators. Clinical outcome with enalapril in symptomatic chronic heart failure; a dose comparison. Eur Heart J 1998;19:481–9. Packer M, Poole-Wilson PA, Armstrong PW, et al. Comparative effects of low and high doses of the angiotensin-converting enzyme inhibitor, lisinopril, on morbidity and mortality in chronic heart failure. ATLAS Study Group. Circulation 1999;100:2312–8. CIBIS Investigators and Committees. A randomized trial of beta-blockade in heart failure. The Cardiac Insufficiency Bisoprolol Study (CIBIS). Circulation 1994;90:1765–73. Wikstrand J, Hjalmarson A, Waagstein F, et al; MERIT-HF Study Group. Dose of metoprolol CR/XL and clinical outcomes in patients with heart failure: analysis of the experience in metoprolol CR/XL randomized intervention trial in chronic heart failure (MERIT-HF). J Am Coll Cardiol 2002;40:491–8. Simon T, Mary-Krause M, Funck-Brentano C, et al. Bisoprolol dose-response relationship in patients with congestive heart failure: a subgroup analysis in the Cardiac Insufficiency Bisoprolol Study (CIBIS II). Eur Heart J 2003;24:552–9. Bristow MR, Gilbert EM, Abraham WT, et al. Carvedilol produces dose-related improvements in left ventricular function and survival in subjects with chronic heart failure. MOCHA Investigators. Circulation 1996;94:2807–16. Scott IA, Denaro CP, Flores JL, et al; Brisbane Cardiac Consortium Leader Group. Quality of care of patients hospitalized with congestive heart failure. Intern Med J 2003;33:140–51. Atherton JJ, Hayward CS, Wan Ahmad WA, et al; ADHERE International–Asia Pacific Scientific Advisory Committee. Patient characteristics from a regional multicenter database of acute decompensated heart failure in Asia Pacific (ADHERE International-Asia Pacific). J Card Fail 2012;18:82–8. Maggioni AP, Dahlstrom U, Filippatos G, et al; Heart Failure Association of ESC (HFA). EURObservational Research Programme: the Heart Failure Pilot Survey (ESC-HF Pilot). Eur J Heart Fail 2010;12:1076–84. Maggioni AP, Anker SD, Dahlstrom U, et al; Heart Failure Association of the ESC. Are hospitalized or ambulatory patients with heart failure treated in accordance with European Society of Cardiology guidelines? Evidence from 12,440 patients of the ESC Heart Failure Long-Term Registry. Eur J Heart Fail 2013;15:1173–84. Ryder M, Travers B, Timmons L, et al. Specialist nurse supervised in-hospital titration to target dose ACE inhibitor – is it safe and feasible in a community heart failure population? Eur J Cardiovasc Nurs 2003;2:183–8. Cleland JG, Swedberg K, Follath F, et al; Study Group on Diagnosis of the Working Group on Heart Failure of the European Society of Cardiology. The EuroHeart Failure survey programme – a survey on the quality of care among patients with heart failure in Europe. Part 1: patient characteristics and diagnosis. Eur Heart J 2003;24:442–63. Lenzen MJ, Boersma E, Reimer WJ, et al. Under-utilization of evidence-based drug treatment in patients with heart failure is only partially explained by dissimilarity to patients enrolled in landmark trials: a report from the Euro Heart Survey on Heart Failure. Eur Heart J 2005;26:2706–13. Gustafsson F, Schou M, Videbaek L, et al. Treatment with betablockers in nurse-led heart failure clinics: titration efficacy and predictors of failure. Eur J Heart Fail 2007;9:910–6. Cabana MD, Rand CS, Powe NR, et al. Why don’t physicians follow clinical practice guidelines? A framework for improvement. JAMA 1999;282:1458–65. Carroll R, Mudge A, Suna J, et al. Prescribing and up-titration in recently hospitalized heart failure patients attending a disease management program. Int J Cardiol 2016;216:121–7. Fonarow GC, Abraham WT, Albert NM, et al. Dosing of betablocker therapy before, during, and after hospitalization for heart failure (from Organized Program to Initiate Lifesaving Treatment in Hospitalized Patients with Heart Failure). Am J Cardiol 2008;102:1524–9. Jain A, Mills P, Nunn LM, et al. Success of a multidisciplinary heart failure clinic for initiation and up-titration of key therapeutic agents. Eur J Heart Fail 2005;7:405–10. Driscoll A, Srivastava P, Toia D, et al. A nurse-led up-titration clinic improves chronic heart failure optimization of betaadrenergic receptor blocking therapy – a randomized controlled trial. BMC Res Notes 2014;7:668. Driscoll A, Krum H, Wolfe R, et al; BENCH Study Group. Nurseled titration of β-adrenoreceptor blocking agents in chronic heart failure patients in the community. 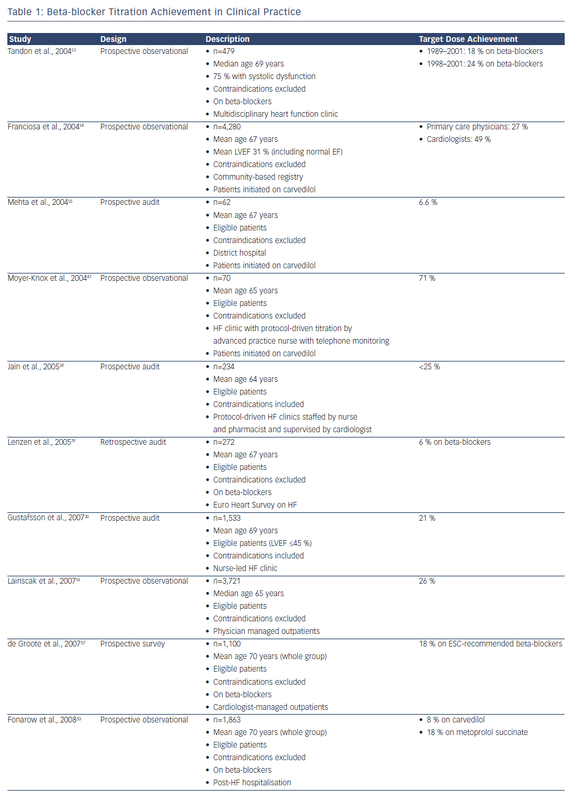 Journal of Cardiac Failure 2011;17:224–30. Martinez AS, Saef J, Paszczuk A, et al. Implementation of a pharmacist-managed heart failure medication titration clinic. Am J Health Syst Pharm 2013;70:1070–6. Lowrie R, Mair FS, Greenlaw N, et al; Heart Failure Optimal Outcomes from Pharmacy Study (HOOPS) Investigators. Pharmacist intervention in primary care to improve outcomes in patients with left ventricular systolic dysfunction. Eur Heart J 2012;33:314–24. Ansari M, Shlipak MG, Heidenreich PA, et al. Improving guideline adherence: a randomized trial evaluating strategies to increase beta-blocker use in heart failure. Circulation 2003;107:2799–804. Scott IA, Denaro CP, Bennett CJ, et al. Achieving better in-hospital and after-hospital care of patients with acute cardiac disease. Med J Aust 2004;180:S83–8. Laramee AS, Levinsky SK, Sargent J, et al. Case management in a heterogeneous congestive heart failure population: a randomized controlled trial. Arch Intern Med 2003;163:809–17. Moyer-Knox D, Mueller TM, Vuckovic K, et al. Remote titration of carvedilol for heart failure patients by advanced practice nurses. Journal of Cardiac Failure 2004;10:219–24. Steckler AE, Bishu K, Wassif H, et al. Telephone titration of heart failure medications. J Cardiovasc Nurs 2011;26:29–36. Guder G, Stork S, Gelbrich G, et al. Nurse-coordinated collaborative disease management improves the quality of guideline-recommended heart failure therapy, patientreported outcomes, and left ventricular remodelling. Eur J Heart Fail 2015;17:442–52. Whellan DJ, Hasselblad V, Peterson E, et al. Metaanalysis and review of heart failure disease management randomized controlled clinical trials. Am Heart J 2005;149:722–9. Takeda A, Taylor SJ, Taylor RS, et al. Clinical service organisation for heart failure. Cochrane Database Syst Rev 2012;9:CD002752. Driscoll A, Currey J, Tonkin A, et al. Nurse-led titration of angiotensin converting enzyme inhibitors, beta-adrenergic blocking agents, and angiotensin receptor blockers for people with heart failure with reduced ejection fraction. Cochrane Database Syst Rev 2015;(12):CD009889. Hickey A, Suna J, Marquart L, et al. Improving medication titration in heart failure by embedding a structured medication titration plan. Int J Cardiol 2016;224:99–106. Clark RA, Driscoll A. Access and quality of heart failure management programs in Australia. Aust Crit Care 2009; 22:111–6. Swennen MH, Rutten FH, Kalkman CJ, et al. Do general practitioners follow treatment recommendations from guidelines in their decisions on heart failure management? A cross-sectional study. BMJ Open 2013;3:e002982. Luttik ML, Jaarsma T, van Geel PP, et al. Long-term follow-up in optimally treated and stable heart failure patients: primary care vs. heart failure clinic. Results of the COACH-2 study. Eur J Heart Fail 2014;16:1241–8. Gjesing A, Schou M, Torp-Pedersen C, et al. Patient adherence to evidence-based pharmacotherapy in systolic heart failure and the transition of follow-up from specialized heart failure outpatient clinics to primary care. Eur J Heart Fail 2013;15:671–8. Tandon P, McAlister FA, Tsuyuki RT, et al. The use of betablockers in a tertiary care heart failure clinic: dosing, tolerance, and outcomes. Arch Intern Med 2004;164:769–74. Franciosa JM, Massie BM, Lukas MA, et al; COHERE Participant Physicians. B-blocker therapy for heart failure outside the clinical trial setting: Findings of a communitybased registry. Am Heart J 2004;148:718–26. Mehta PA, McDonagh S, Poole-Wilson PA, et al. Heart failure in a district general hospital: are target doses of betablockers realistic? QJM 2004;97:133–9. Lainscak M, Moullet C, Schön N, et al. Treatment of chronic heart failure with carvedilol in daily practice: the SATELLITE survey experience. Int J Cardiol 2007;122:149–55. Rector TS, Anand IS, Nelson DB, et al. Carvedilol versus controlled-release metoprolol for elderly veterans with heart failure. J Am Geriatr Soc 2008;56:1021–7. Calvert MJ, Shankar A, McManus RJ, et al. Evaluation of the management of heart failure in primary care. Fam Pract 2009;26:145–53. Bosch M, Wensing M, Bakx JC, et al. Current treatment of chronic heart failure in primary care; still room for improvement. J Eval Clin Pract 2010;16:644–50.